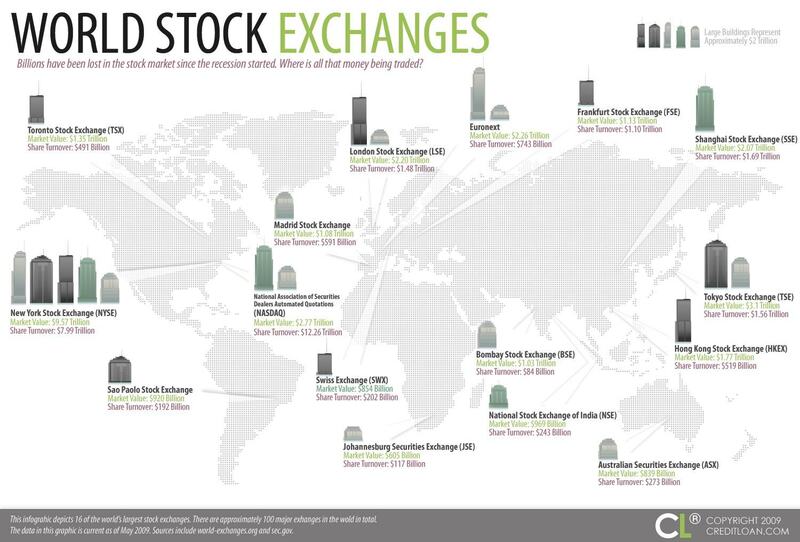 Of the approximately 100 major exchanges located throughout the world, 16 of the world’s largest stock exchanges are depicted on the above image. The map also shows the market value and share turnover of each exchange. Share turnover is defined as a measure of stock liquidity. The market value is represented by buildings, with each large building equivalent to approximately $2 trillion. As the picture shows, the United States has two of the top three exchanges based on market value. The New York Stock Exchange is the largest exchange by far with a market value of $9.57 trillion and share turnover of $7.99 trillion. The NYSE combined with the NASDAQ exchange, which has a market value of $2.77 trillion and a chart topping share turnover of $12.26 trillion, enables the U.S. to account for 38% of the total market value of the exchanges represented on this graphic.